Kevin Hart stepping aside as host of the Academy Awards 2019 after alleged homophobic tweets resurfaced, is just the latest controversy to hit Hollywood's big night out. From streakers to bizarre name pronunciations to the wrong winners being announced, the Oscars has seen it all. Here is a look back at some of the ceremony's most controversial moments. 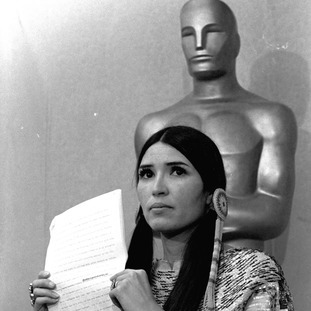 The venerated star was named best actor in 1973 for his role in The Godfather, but stayed away from the ceremony, sending Native American actress and activist Sacheen Littlefeather in his place. During her rejection speech, Littlefeather said: "He very regretfully cannot accept this very generous award. And the reasons for this being are the treatment of American Indians today by the film industry." Since the stunt, winners are no longer allowed to send other people to accept their awards – the host accepts it instead. English actor David Niven was one of the presenters in 1974 for the 46th Academy Awards. During the ceremony, a naked Robert Opel - an artist, photographer and gay rights activist sprinted across the stage flashing the peace sign. Unruffled, Niven famously quipped: "Isn't it fascinating to think that probably the only laugh that man will ever get in his life is by stripping off and showing his shortcomings?" John Travolta introduced the audience to famous singer… Adele Dazeem? Travolta was on stage during the 2014 Oscars, with the task of introducing Idina Menzel for her performance of Let It Go from Frozen. Inexplicably, the Grease actor said: "Please welcome the wickedly talented, one and only Adele Dazeem." The gaff spawned a wave of internet memes and remains a popular clip on YouTube. Affleck had been dogged by allegations of sexual harassment in the run-up to the 2017 Oscars, but was still nominated for best actor for his role in Manchester By The Sea. Brie Larson, a prominent advocate of sexual assault victims, presented Affleck with the gong but appeared visibly frustrated about the result. She gave him a brief hug but did not applaud. Larson later told Vanity Fair: "I think that whatever it was that I did on stage kind of spoke for itself. I've said all that I need to say about that topic." But perhaps the most memorial Oscar mishap was the Best Picture mix up in 2017 Oscars. Traditionally the last gong to be announced, best picture award is the big prize of the night, and was on this occasions being handed out by Hollywood veterans Faye Dunaway and Warren Beatty. La La Land was read out as the winner to great excitement from cast and crew who got up on stage to accept the award. Only to find out that the real best picture was Moonlight. La La Land producer Jordan Horowitz announced, “"We lost by the way. "There's a mistake. Moonlight, you guys won best picture. "This is not a joke. Moonlight has won best picture." The look on Emma Stone's, who had won Best Actress, face, in the picture above says it all.